The dsp.BinaryFileWriter System object™ writes multichannel signal data to a binary file. If the header is not empty, then the header precedes the signal data. The object specifies the file name and the structure of the header. The first time you write to the file, the object writes the header, followed by the data. On subsequent calls, the object writes the remaining data. If the header is empty, then no header is written. The object can write floating-point data and integer data. To write character data and fixed-point data, see Write and Read Character Data and Write and Read Fixed-Point Data. The input data can be real or complex. When the data is complex, the object writes the data as interleaved real and imaginary components. For an example, see Write and Read Fixed-Point Data. By default, the writer uses the endianness of the host machine. To change the endianness, you can use the swapbytes function. For an example, see Change Endianness of Data Before Writing . Create the dsp.BinaryFileWriter object and set its properties. writer = dsp.BinaryFileWriter creates a binary file writer object, writer, using the default properties. writer = dsp.BinaryFileWriter(fname) sets the Filename property to fname. writer = dsp.BinaryFileWriter(fname,Name,Value) with Filename set to fname and each property Name set to the specified Value. Unspecified properties have default values. Name of the file to which the object writes the data, specified as a character vector or a string scalar. You must specify the full path for the file. Header to write at the beginning of the file, specified as a structure. The structure can have an arbitrary number of fields. Each field of the structure must be a real matrix of a built-in type. For example, if HeaderStructure is set to struct('field1',1:10,'field2',single(1)), the object writes a header formed by 10 double-precision values, (1:10), followed by one single precision value, single(1). If you do not specify a header, the object sets this property to an empty structure, struct(). writer(data) writes data to the binary file in a row-major format. Each call to the algorithm writes the elements of data at the end of the file. At the first call to the algorithm, the object writes the header first, followed by the data. If the header is empty, then no header is written. The input data can be real or complex. For complex data, real and imaginary parts are interleaved. For example, if the data equals [1 2; 3 4]+1j*[5 6; 7 8], then the object writes the elements as 1 5 2 6 3 7 4 8. Data to be written to the binary file in a row-major format, specified as a vector or a matrix. The object writes the data in row-major format. For example, if the input array is [1 2 4 5; 8 7 9 2], the object writes the data as [1 2 4 5 8 7 9 2]. The input data can be real or complex. For complex data, real and imaginary parts are interleaved. For example, if the data equals [1 2; 3 4]+1j*[5 6; 7 8], then the object writes the elements as [1 5 2 6 3 7 4 8]. Create a binary file with a custom header using the dsp.BinaryFileWriter System object. Write data to this file. Read the header and data using the dsp.BinaryFileReader System object. FrameSize (number of rows in the data matrix) set to 150. NumChannels (number of columns in the data matrix) set to 1. Create a dsp.BinaryFileWriter object using this header. The object writes the header first, followed by the data, to ex_file.bin. The data is a noisy sine wave signal. View the data in a time scope. Release the writer so that the reader can access the data from this file. Read the data from the binary file, ex_file.bin, using the dsp.BinaryFileReader object. The file contains the header data followed by the actual data. The object reads the binary data until the end of file is reached. Specify the header to the reader using the HeaderStructure property of the reader object. If the exact header is not known on the reader side, you must at least specify the prototype of the header. That is, the number of fields, and the data type, size, and complexity of each field in the prototype must match with the header data written to the binary file. When the readHeader function reads the data from the binary file, the function extracts the header information based on how the fields are specified in the header prototype. For example, a header field set to 'double' on the writer side can be specified as any string of 6 characters on the reader side. The readHeader function reads this field as a string of 6 characters from the binary file, which matches with 'double'. The header data extracted by the readHeader function is assigned to the corresponding properties of the reader object. Initialize a scope on the reader side to view the extracted binary file data. The data is read into a single channel (column) containing multiple frames, where each frame has 150 samples. View the data in a time scope. Set the reader to read data in frames of size 300. Verify that the data read matches the data written to the file. 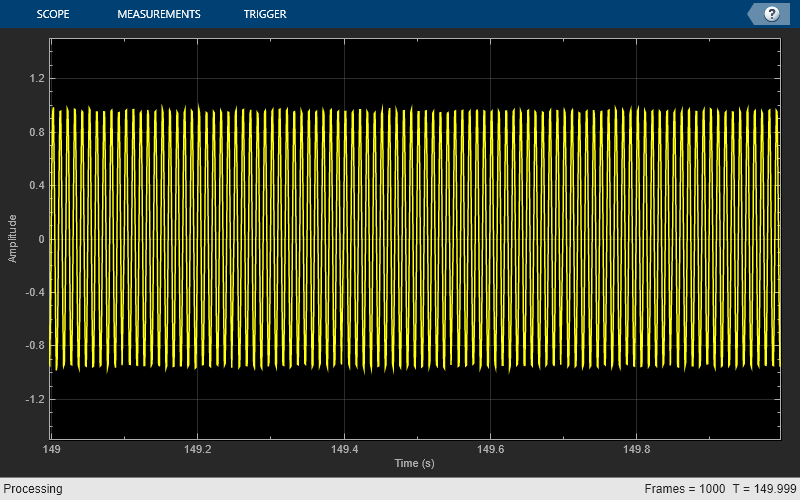 Even when the reader reads data with a different frame size, the output in both time scopes matches exactly. Use a dsp.BinaryFileReader System object™ to read data from a binary file in a row-major format. Write the matrix A to the binary file Matdata.bin using a dsp.BinaryFileWriter object. The object writes the specified header followed by the data. FrameSize (number of rows in the data matrix) set to 3. NumChannels (number of columns in the data matrix) set to 4. Release the writer so that the reader can access the data. Specify the header using the HeaderStructure property of the reader object. If the exact header is not known, you must at least specify the prototype of the header. That is, the number of fields, and the data type, size, and complexity of each field in the prototype must match with the header data written to the binary file. The dsp.BinaryFileReader object reads the binary file Matdata.bin until the end of file is reached. Configure the System object to read the data into 4 channels, with each channel containing 5 samples. Each loop of the iteration reads a channel (or frame) of data. Each frame of out contains frames of the matrix A, followed by zeros to complete the frame. The original matrix A contains 4 channels with 3 samples in each channel. The reader is configured to read data into 4 channels, with each channel containing 5 samples. Because there are not enough samples to complete the frame, the reader object appends zeros at the end of each frame. Create a dsp.BinaryFileWriter object which writes to a file named myfile.dat. There is no header. The data is complex. Read the data using the dsp.BinaryFileReader System object™. To view data in the format it is written to the file, set the IsDataComplex property to false. The reader object reads the data as a sequence of numbers in a row major format. Set SamplesPerFrame to 1 and NumChannels to 8. You can see that the real and imaginary components of the original data are sample interleaved. The dsp.BinaryFileWriter and dsp.BinaryFileReader System objects do not support writing and reading fixed-point data. As a workaround, you can write the stored integer portion of the fi data, read the data, and use this value to reconstruct the fi data. Create an fi object to represent 100 signed random numbers with a word length of 14 and a fraction length of 12. Write the stored integer portion of the fi object to the data file myFile.dat. The built-in data type is int16, which can be computed using class(storeIntData). Specify the reader to read the stored integer data as int16 data with 100 samples per data frame. The real-world value of the fixed-point number can be represented using 2(-fractionLength)(storedInteger). If you know the signedness, word length, and fraction length of the fixed-point data, you can reconstruct the fi data using fi(realValue,signedness,wordLength,fractionLength). In this example, the data is signed with a word length of 14 and a fraction length of 12. Verify that the writer data is the same as the reader data. The dsp.BinaryFileWriter and dsp.BinaryFileReader System objects do not support writing and reading characters. As a workaround, cast character data to one of the built-in data types and write the integer data. After the reader reads the data, convert the data to a character using the char function. Cast a character into uint8 using the cast function. Write the cast data to the data file myFile.dat. Configure the reader to read the cast data as uint8 data. Verify that the writer data is the same as the reader data. By default, the reader returns the data in a column-major format. By default, the dsp.BinaryFileWriter System object™ uses the endianness of the host machine. To change the endianness, use the swapbytes function. Write a numeric array into myfile.dat using the dsp.BinaryFileWriter object. Before writing the data, change the endianness of the data using the swapbytes function.